We are pleased to announce that ESATAN-TMS r6 is now released and available for download from our web site. New exciting features have been added to the product. 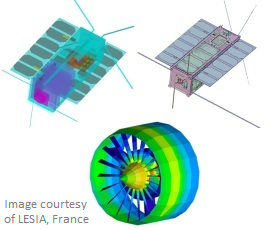 ESATAN-TMS provides a powerful and integrated thermal modelling environment, supporting the complete thermal analysis process from geometry creation, radiative and thermal analysis, to the post-processing of the results. ESATAN-TMS r6 is now available and includes major changes to its modelling capability. A significant extension to the product is that you can now define models containing both 2D primitives (shells) and 3D primitives (solids); both of which support either a lumped parameter or a finite element representation. The supporting functionality such as boundary conditions, contact zones, groups and user-defined conductors, all have been extended to support solid geometry. Another major change has been the replacement of the 3D visualisation component with a new graphical engine providing high performance graphics. The new visualisation was a major rewrite of the visualisation component and this now provides Workbench with the platform for the future. This not only gives a significant improvement to the graphics performance, but you can now select multiple items within the visualisation and also visualise selected geometry as transparent. A request from customers has been to allow the model to be partitioned into separate cavities, where the radiative exchange between the surfaces of the cavity is isolated from the rest of the model. ESATAN-TMS r6 now allows cavities to be automatically defined from a given surface and radiative analysis to be performed separately on each cavity. This provides the flexibility to model the cavities separately and to avoid repeating the radiative analysis unnecessary when geometrical changes occur outside of a given cavity.